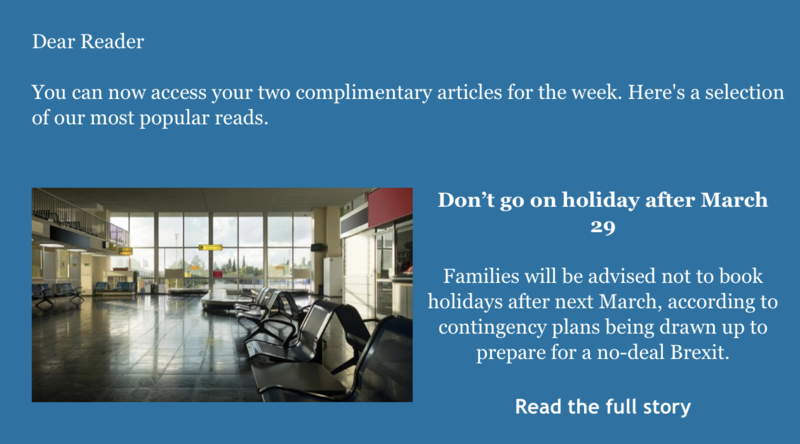 The Times and Sunday Times newspapers have upset the travel industry again by sending out an email to subscribers with the subject line 'Cancel your summer holiday'. The email prompts subscribers to read their two complimentary articles for the week and lists the most popular recent stories. Top of the list is the story which ran on Sunday claiming that families will be advised not to book holidays after March. The report, which has riled travel businesses, says the government is considering issuing the warning as part of contingency plans being drawn up to prepare for a no-deal Brexit. The claim was immediately denied by number 10, but travel companies say the damage has already been done. TravelMole has contacted the Sunday Times for a response and AITO and ABTA have also written to the newspaper to raise their concerns. AITO executive director Kate Kenward said: "The Times and Sunday Times editorial and marketing departments are clearly not speaking to each other. "I find it astounding that these papers are behaving like the red tops, sensationalising a story to sell papers/subscriptions which could not only harm hundreds of businesses and jobs but also rob consumers of their right to a holiday. "They are risking their own integrity by publishing unsubstantiated articles and only adding to consumers angst about the current situation with Brexit." ABTA chief executive Mark Tanzer added: "On Sunday the national media included our statement, which refutes the claim and highlights that the European Commission has confirmed that, even in the event of a no-deal, flights will operate and a visa will not be required. "We have since written to the Sunday Times to raise our concerns about the article, and have also been in touch with Ministers and officials at Government. "We are encouraging ABTA Members to share our Brexit advice with their customers, a downloadable pdf can be found in the MemberZone along with a graphic for use across online channels." It is also reaching out to consumers directly through a social media advertising campaign providing reassurances that deal or no-deal, flights will continue. On Monday Transport Secretary Chris Grayling published an open letter to the aviation industry in a bid to calm their concerns. But the letter fell short of giving a guarantee that planes will continue to fly if there's a no-deal Brexit. LibDem leader Vince Cable told the travel industry it was simply 'caught in a foolish and dangerous game of chicken' by the government, which is trying to frighten MPs and the wider public into supporting the prime minister's exit plan. Vince, who is MP for Twickenham where AITO is based, was responding to a letter from the association of specialist operators demanding an apology from the government. AITO also called for an assurance to the British public that flights will not stop, as has already been assured to the industry.